Are learning theories even relevant any more? As a teacher, facilitator or instructional / learning designer, do you ever think about learning theories? What value do they have in your teaching or design practice? Do you think back to what you learned about B.F. Skinner’s experiments as you “chain” events in a lesson to help your students learn a new procedure? Maybe you try to reward “good learning” with bonus marks or badges? Or do you recall David Ausubel’s theoretical perspective (cognitive) when you develop a new advance organizer to help students learn a complex concept or theory? If you apply a traditional design approach (integrated, outcomes-based, structured weekly units with tests and assignments), do you reflect on the way you present information while you remember the cognitivist “information processing model”? Lave and Wenger introduced us to ideas around group learning with their theories of situated learning and legitimate peripheral participation. 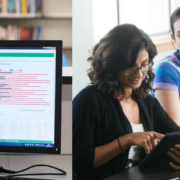 Have those ideas influenced how you set up group learning projects? When we piloted our new FLO-Design workshop in January 2017, we included an optional review of the three major groups of learning theories – behaviorism, cognitivism, constructivism (and a fourth technology-focused perspective – connectivism – see below), to ground the participants’ work in selecting and applying different instructional / learning design approaches. But I’ve been reading and listening to discussions about some of the inadequacies of our current education system and our teaching approaches and wondering more and more how relevant or meaningful a “grounding” in somewhat outdated perspectives (and research) is for the increasing diversity of the learners we serve in online and blended learning? Each learning theory or group of theories has its critics. A consistent criticism applied to learning theories is that they are too focused on one area or perception of the human experience of learning – from visible changes in behaviour (behaviourism) to how information that is collected by the senses is processed, organized and retained for future retrieval (cognitivism) to how to help learners “make meaning” from new material (constructivism) and finally to how people use virtual connections with others and with knowledge (through the Internet or other similar networks) to collect and use knowledge as they need it. Should we be seeking one unifying theory to show us how to understand the different aspects of learning or should we be continuing to develop separate theories that address how we learn different types and levels of knowledge in different stages of our lives? But assessing the relevance of recognized learning theories goes beyond simply criticizing what is missing from each group of theories or the evidence that supports each proposed interpretation. We have recognized (remembered?) the powerful impact of emotion, beliefs and cultural understandings and the needs of diverse learners to feel empowered to take part in the teaching and learning interactions, environments and outcomes. Certainly in North America, educators are asked to consider “making space” for different voices and ideas to be heard; instead of following a particular theory or group of ideas of how people learn, perhaps we need to let the learners set the pace and identify ways they find helpful in making new learning meaningful? A growing body of evidence is being shared by neuroscientists as they continue to refine technological tools like fMRI (functional magnetic resonance imaging) to map the ways the brain responds to different stimuli and conditions such as stress, rest, and exercise. So, should we throw out the established learning theories and just follow what neuroscientists tell us about how they’re interpreting what they “see”? Although many of us are drawn to the science of cognition as a way to help us teach and learn more effectively, scientists have been advising caution in how we interpret their results and a recent article in Psychology Today points out some serious issues with the software that is used for fMRIs. It is difficult to reconcile the limited scope of early learning theories with the breadth of possibilities we’re seeing in how we can teach and the increasing diversity of learners and what they want and need to learn. A first step is to revisit our reliance on traditional educational theories and to find better ways to support educators and instructional / learning designers to design effective learning experiences and environments. 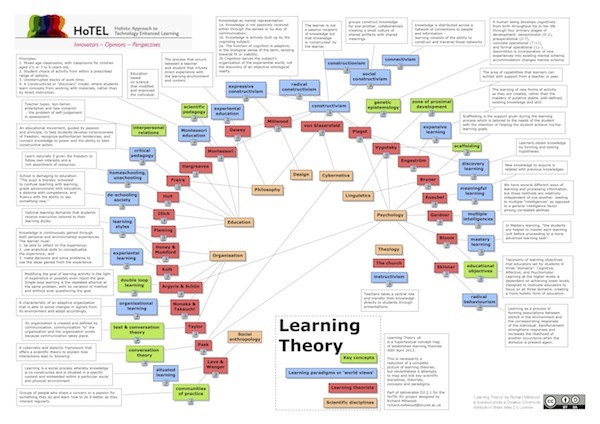 Note: If you want to explore even further, check out the comprehensive and interactive learning theories map, created by Richard Millwood for a European Union project: HoTEL (Holistic Approach to Technology Enhanced Learning). 0 0 Sylvia Riessner Sylvia Riessner2017-08-30 08:01:222017-08-30 13:43:55Are learning theories even relevant any more?